Did a little Easter appetizer. 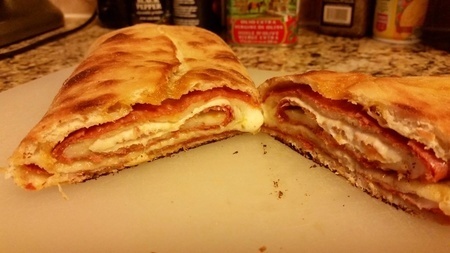 I usually call this pepperoni bread but I guess it is actually a stromboli or pepperoli. Master dough with starter with All Trumps and I used Red Star Champaign yeast (the yeast performed the same as regular Red Star yeast and imparted no difference on taste that I could detect). Filled with pepperoni, whole milk mozzarella, a sprinkle of Parmegiano reggiano and oregano then rolled up and brushed with olive oil. Baked at 500 on 1/4" steel. I just used one steel plate since I noticed the bottom was browning very fast and I didn't want to risk burning it by transferring to the second, hotter plate. I made a second one that also included ricotta. My seam wasn't the best as you can see but it held. I am very happy with the results. The seam is barely noticeable Chuck. And it's mostly aesthetic. That said, it looks like a huge success. Well, definitely still good after 20 years. Mother Mary's Pizza here in Clovis CA does a version with ricotta. I've done one like it for a while but just on a sheet pan on the oven rack at 350 so it doesn't get as browned or crisp. Normally we just have slices of that one cold. Amazing how the same ingredients can turn into something completely different with just a few changes and both are a still good in their own way. There is a bakery we go to outsode Philly that has all sorts of "strombolli breads" in a refrigerated display by the register; I can never resist buying a couple on the way out. I will try to get pics of the process if I do it again in the near future.